The genome provides the salient information about all body components and the general layout of the regulation of gene expression. 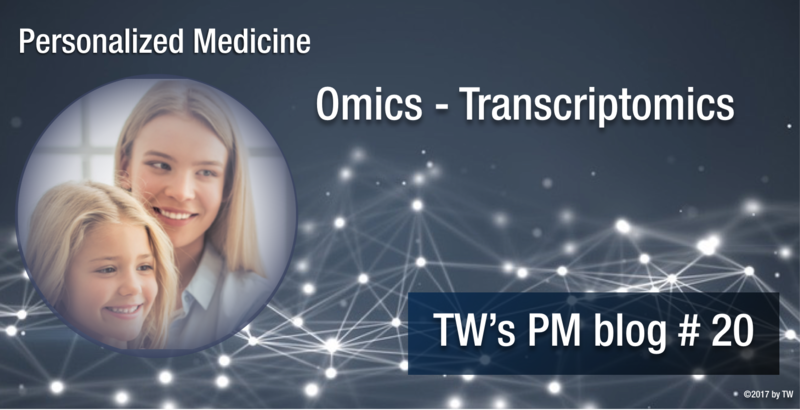 Epigenomics controls which parts of the genome are actually to be transcribed at a particular location and time. Transcriptomics is concerned with the actual execution of such regulation causing the production of the RNA transcripts of genomic DNA. However, in addition to Epigenomics there are several layers of control imbedded in Transcriptomics itself. Epigenomics “potentiation” of a region is called that way because the control mechanisms of transcriptomics can only act within potentiated regions. However, the highly complex integrated circuits of transcription control cannot be directly observed. For that reason clinical trnascriptomics is usually concerned with the results of the regulation, i.e. the changing levels of RNA transcripts, most prominently the mRNAs encoding proteins. Steady-state levels of RNAs can be measured either by microarrays (see below) or RNA-seq. This is a special form of Next Generation sequencing (NGS) focusing on the determination of all present RNA sequences in a sample. A healthy cell or organ has a characteristic internal relation of the amounts of most of its RNA molecules, which resembles the natural balance of gene expression. Although exact levels vary among people the overall composition is rather well preserved. In case of severe illness or cancer a number of RNAs go clearly up or down, which is indicative for the disease, often even for the molecular cause of the disease. Therefore, RNA-measurements in blood samples or tissue biopsies can be used to determine if the transcriptome (all RNAs in a cel or tissue sample) is off balance or not. Cells from blood contain RNA and often react characteristically to a disease by changing their RNA expression. Tissue samples from tumors or other diseased tissues also exhibit characteristic changes that can be detected. Characteristic means associated with a disease not necessarily understood in all consequence. The major technologies used to be microarrays, where short DNA probes binding to individual RNAs are fixed onto a glas slide (20,000 or more genetic loci at once). Binding of the corresponding RNAs produces a semi-quantitative signal. The newer NGS technology of RNA-seq is far superior, avoiding some of the systemic flaws of microarrays (e.g. saturation, or cross-hybridization) and is far more sensitive. However, it is still more expensive and more difficult to perform. Therefore, microarrays are used in parallel with NGS RNA-seq. There are two developments that will increase the medical value of RNA-seq dramatically: The length of a of sequence that can redetermined in one piece used to be rather short, requiring stitching together longer molecules. Now this read length is approaching the whole length of the RNAs allowing much better and more precise detection. 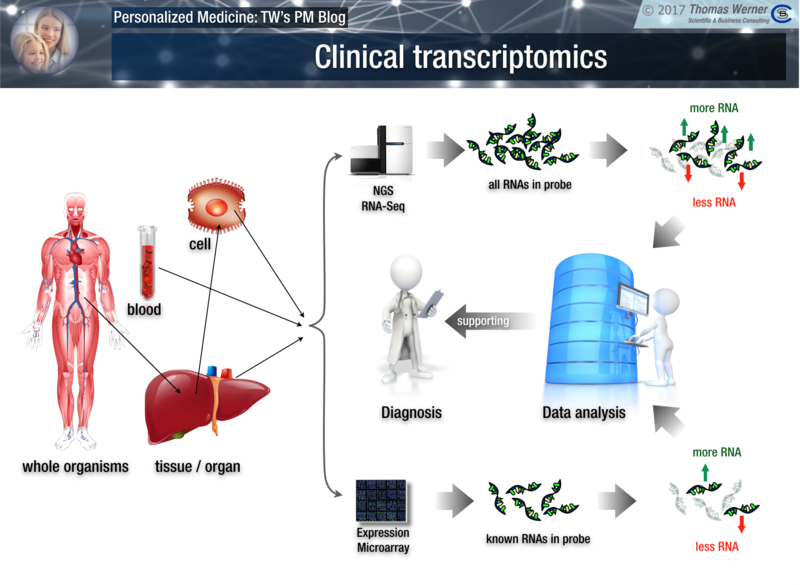 The second important development is the perfection of single-cell RNA-seq allowing detection of the complete transcriptome of a single cells. That way, tumor sub-typing from one biopsy becomes possible as the resolution is increased to the level of a single cell. Next week we will follow the chain of events further down beyond transcriptomics into the actual production and measurement of proteins. Most biomarkers in clinical use today are proteins.